Camp 61 is searching for a hard working/dependable person to work in our kitchen as a cook. This position can be year round and either full or part time. Experience a plus but we are willing to train the right individual. Fast paced in the summer and fall and more relaxing in the winter and spring. We are open 7 days a week from 11 a.m. seating until 8 p.m. If you are interested please email us at Camp61inc@gmail.com or call Carol at 218-226-4989. Rustic Inn Cafe & Gifts are currently hiring both Full and Part Time Cooks and Bakers. Flexible scheduling, seasonal or year round positions available. Experience preferred, but will train the right candidate. Fast paced restaurant, open daily, friendly working environment. Above average compensation. Meals, uniforms, and discounts provided. Benefits and 401k are available. 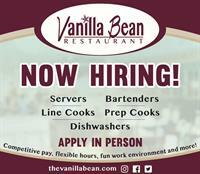 The Vanilla Bean Restaurant in Two Harbors has immediate openings for full and part-time cooks. Apply in person or e-mail us at thebean@thevanillabean.com. Competitive wages, benefits and more. We are currently hiring friendly outgoing Retail Sales Staff. Full and Part Time hours available. Flexible Schedules, fun working environment. Meals, discounts and benefits available.